Toronto Real Estate Board (TREB) reported December Greater Toronto Area (GTA) home resale numbers. 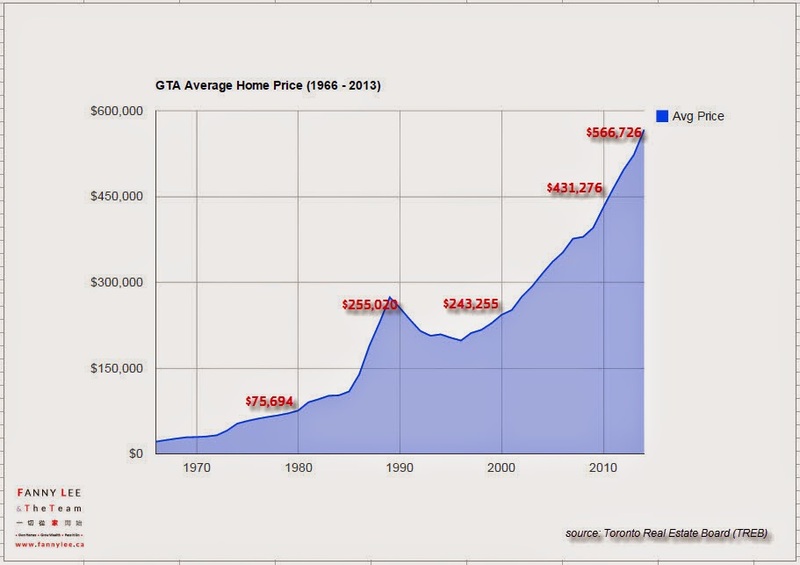 We had the 2014 annual data to chart our GTA Average Home Price monitoring. 2014 recorded 92,287 sales representing a 6.7% increase from 2013. Compared to the 2007 record of 93,193 resales, 2014 was short by 906 transactions. The average home sales price in 2014 was $566,726 as opposed to $522,298 registering a 8.4% annual growth. When TREB first started tracking home resale price in 1966, the average home sale price was $21,360. In 48 years, the value has grown 26.53 times. It translates to an annual growth rate of 6.98%.